Sega Channel was a project developed by Sega for the Sega Mega Drive video game console. Completely revolutionary at the time of release (bar a failed attempt with the earlier Intellivision console), it was a method capable of streaming digital content to Mega Drive owners through cable television. Sega Channel services were offered across the globe by various providers, though the most notable and well-remembered was the service provided for North American consumers. Traditionally in order to gain access to a Sega Channel, customers would pay for a monthly subscription, and in return be given unlimited access to a specified amount of video games. Network providers would be able to change the details of the service at any given point, meaning the Sega Channel was constantly evolving, with new games appearing throughout the weeks and months. A number of games were even made Sega Channel exclusives. Today, services such as these tend to be provided by the internet, however back then, games on demand was a far less common occurence. Success of the Sega Channel varies between countries - in North America the Sega Channel was broadcast for a full four years, whereas in others it lasted merely months. Due to the nature of how the Sega Channel service operated, it is extremely difficult to document - downloaded games would be erased upon turning off the console, and adequate methods of saving and recording Sega Channel content were not readily available. As such, large parts of the service to this day remain a mystery - it cannot be emulated like standard Mega Drive cartridges, and as it largely pre-dates the internet, details are very hard to come by. The Sega Channel was envisioned as a means of distributing Sega Mega Drive video games through a digital medium, as opposed to using physical cartridges bought from over the counter. It was achieved through the use of television, as opposed to the internet which would be typically preferred today. To access the Sega Channel, customers needed to buy a Sega Channel adapter and subscribe to a cable television package which offered a Sega Channel stream. Adapters were primarily available through mail order, though some were given to customers who had just signed up with a compatible TV package as part of their subscription deal. They could also be purchased from headends or offices of participating cable companies. Adapters came in several shapes and sizes but share the same basic design - they are to be placed within the Mega Drive's cartridge slot and then linked to the cable television box via an RF connector. Adapters also require their own external power supply, and depending on the model, come with plastic spacers to make sure the unit can fit comfortably in both the original Mega Drive/Genesis and Mega Drive/Genesis II consoles. 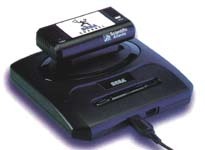 Unlike other add-ons for the system, such as the Sega Mega-CD, Sega 32X or even the earlier Sega Mega Modem, the Sega Channel adapter does not need to be plugged in to any of the ports at the back of the console, meaning (theoretically) the Sega Channel adapter is compatible with any device with a Mega Drive/Genesis cartridge slot. Diagram of the delivery system (US). The Sega Channel service differed from other television channels as there was nothing to "watch". Instead, digital data would be broadcast through the cable provider and received by the Sega Channel adapter, which in turn would attempt to convert it into program code. Much like an ordinary television channel, the user had no means of determining what was broadcast; while the contents were transmitted on a loop, the adapter is often forced to "wait" until it got access to the data it required. In Europe, particularly the United Kingdom, the service can be likened to Teletext, just with all of the transmission being reserved for digital data. If the broadcast matched with the request from the adapter, the program would be downloaded and stored in the unit's RAM. Nothing was saved permanently - if the user turned off the device all saved data would be lost. A soft reset of the console was still a possibility, however. As a radically different system to a standard cable channel, extra precautions would need to be taken by the cable operators before broadcasting. At the time, all cable services were analogue and would therefore pick up noise, potentially disrupting transmissions. The signal would therefore need to be cleaned by the providers as much as possible. Sega's assistance in these matters meant that despite being a gaming company, they had a major influence in the cable television infrastructure across the world. Distortion, however, was unavoidable in many cases and so downloads would often fail (bearing in mind that some games were 4MB in size). The solution was simply to reset the console and try again. Some accessories are said to have caused trouble with the Sega Channel adapter, namely the Konami Justifier. In the US, a satellite was involved in distributing content, meaning games could be loaded from a central server and broadcast across the United States concurrently. Elsewhere a network of computers were used, with the contents stored on compact disc, with regular updates sent through the mail. Test Drives offered limited play of upcoming and newly released titles. These were generally restricted via a time limit which varied according to genre. Action games could offer twenty minutes of play, whilst more indepth games such as RPGs could offer thirty minutes. Once the exact time limit was reached the adapter would cut out. There was no limit on the number of times Test Drives could be played, although games would have to be reloaded and started from the beginning once the time limit had been reached. Express Games were an additional option where for $2.95 upcoming and newly released titles were available to rent for 48 hours (although technically the rental period only lasted until midnight the following day). These were generally games which had appeared as Test Drives the previous month, and as with other retail titles would not appear on the standard service until at least 90 days after retail release. Express Games first appeared in certain U.S. test markets in July of 1995 with The Adventures of Batman and Robin, and continued through a limited number of U.S. cable operators into 1996 before seemingly being quietly withdrawn. The Sega Channel was primarily envisioned for the North American audience due to relatively widespread cable adoption and the strong positioning of Sega of America at the time. The service was initially announced in April 1993, as a joint venture between Sega, Tele-Communications Inc. (TCI) and Time Warner Cable, with the support of Southern New England Telecommunications Corporation (SNET). At the time, TCI was the largest television cable provider in the United States, and Time Warner was the second largest, each boasting millions of customers and extensive overseas tele-communications businesses. Initial plans were to get the Sega Channel service running by early 1994, though a series of delays saw it pushed back several months. Initial testing of the service actually took place in Japan, where it was trialed among 500 Japanese homes during the first few months of 1994. Manufacturers Scientific-Atlanta finally shipped some US headends in April before demonstrating the system at the National Cable & Telecommunications Association show of 1994. On Sega's end, the firm announced and demonstrated the Sega Channel at Summer CES 1993 in early June. Trials covering 5,000 North American customers in twelve US test markets began on June 6th with Capitol Cablevision (Charleston, South Carolina), and continuing with TCI Cablevision of Texas Inc. (Beaumont, Texas); TCI of New York Inc. (Buffalo, New York); Cablevision of Gastonia (North Carolina); TCI Cablevision of Wyoming Inc. (Cheyenne, Wyoming); TCI Cablevision of Mid-Michigan Inc. (East Lansing, Michigan); TCI Cablevision of Alabama Inc. (Hoover, Alabama); Time Warner Cable (Nashua, New Hampshire); TCI Cablevision of Oregon Inc. (Portland, Oregon); Warner Cable of Reston (Virginia); American Cablevision (St. Louis, Missouri); and TCI Cablevision of Walnut Creek (California). Reaction was positive and a planned national rollout was put in place for December. Also planned was an agreement with the Californian-based Interactive Network Inc., allowing Sega Channel users to submit high scores to a central database through a telephone line. The status of the planned pilot scheme is not currently clear. See also: Sega Channel US schedule. Test markets aside, the Sega Channel officially launched in the US on December 12th 1994 in Pittsburgh, Pennsylvania, with NHL star Mario Lemieux present at a promotional event. At the time, the service was being offered for $12.95 a month with a one-off $25 activation fee. Initially over fifty games were available at any one time, with the contents changing on a monthly basis. At the time, boxed Mega Drive/Genesis games were often retailing for roughly $60, and one or two day rental charges were averaging around $4 across the country. Provided they could get the service, for many the Sega Channel represented a good deal, which may have explained its long-lasting success in the region. The music used across the US Sega Channel service was composed by John Baker, who had supplied the music for ToeJam & Earl. Much of the Sega Channel's graphical style is similar to that game, also. Adapters were manufactured by Scientific-Atlanta and General Instrument (two of the largest manufacturers of cable TV equipment) and were meant to be returned to the cable company upon cancellation of the service. Rollouts continued across 1995, with Suburban Cable of Philadelphia, Pennsylvania broadcasting the service beginning that March and Seattle, Washington in April. 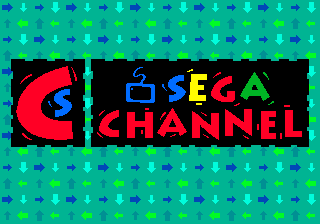 The US service was the biggest and most actively maintained, and at its peak, the Sega Channel was available to one third of the US population and had 250,000 subscribers. A survey conducted by Sports Illustrated for Kids in 1995 even suggested the younger demographic were five times more likely to want Sega Channel over a new console. The US variant tends to overshadow other releases as it is the only version of the service that is well remembered by the gaming public. As well as games, Sega also ran several promotions through the service. Special previews for up-and-coming titles were provided; some import games not found in the United States were exclusive to the service and cheats and tips were handed out. Several games ran special promotions, including Triple Play 96, Primal Rage, Earthworm Jim 2 and Mortal Kombat 3. Three more cable companies, Continental Cablevision (soon after renamed to MediaOne), Adelphia (which went bellyup in 2002 after an accounting scandal) and Cox Cable started offering the Sega Channel in early 1996, giving access to a further 8 million potential consumers. A "wireless" version of the service was displayed in July 1996 at the WCA Show in Denver, Colarado, becoming the standard later in the year. Some plans, however seemingly failed to materialize, such as the rollout of special headsets, 3D glasses and a sharing of technologies with Catapult's XBAND project. Beginning January 17th, 1997, the schedules began to be changed fortnightly, with the service offering 70 games a month (working out as 35 games every two weeks, i.e. technically less choice). The US is the only region thought to have had a purely automated service. 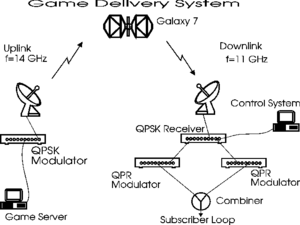 From a central office in Denver, CO (where TCI was headquartered), the channel was transmitted to the Galaxy 7 satellite, and then relayed back down to cable operators across the country. Other regions saw Sega physically send out compact discs to operators. Following a series of failures starting in June 1998, the Galaxy 7 satellite spun out of geostationary orbit in November 2000, and is now drifting across space. The Sega Channel lasted until June 30th 1998 before being closed down for goodMore.... Sega of America did look into a Sega Saturn-compatible variant but the plan never materialized. World Series Baseball '96 L.E. As with most other variants, the Japanese Sega Channel is largely undocumented. Sega Digital Communications, a joint venture by Japan's two largest cable operator investors, Sumitomo Corp.and Itochu Corp. along with Sega was formed on the 31st of July 1994 in order to supply the Sega Channel in Japan, following the aforementioned tests earlier in the year. It initially launched in Tokyo, Yokkaichi, and Suwa with a fee of ¥3,000 for 30 games a month, with a promotional offer of a two month free trial. Only one adaptor was created with stylings similar to the Japanese Mega Drive 2. The Japanese Sega Channel had a bird as a mascot. In Japan, the Sega Channel had a unique BIOS screen featuring Sonic the Hedgehog, and some exclusive content made for that region, including Dyna Brothers 2 Special. This game was eventually released on the Wii's Virtual Console. Another game that is seemingly connected to the Sega Chanel, Game no Kanzume Otokuyou, was discovered in the Sega Dreamcast online disc, Dream Passport 3. Taiwan was the first country outside of Japan and the U.S. to receive the Sega Channel around September/October of 1995. As with Japan and other Asian countries it was distributed by Sega Digital Communications, and is thought to have been the same as the Japanese service with 30 games a month. In September of 1995 Shaw Communications Inc. and Rogers CableSystems Limited announced the formation of a 50%-50% joint venture to distribute the Sega Channel in Canada, in the form of a company founded as SC Interactive Video Inc.. Greater Vancouver was the first to receive the Sega Channel in December 1995 via Rogers, with the service gradually rolling out across the rest of Canada via both Rogers and Shaw throughout 1996. The service was offered at a rate of $19.95 a month, and was similar to the US variant, also including 50 games a month. One difference to the US version was a requirement of the Canadian Radio-television and Telecommunications Commission for there to be a minimum of 10% Canadian content. The Sega Channel of Canada planned to spend in excess of a million dollars on the development of more Canadian designed games for the Sega Channel in order to meet this quota, although in reality the quota was generally met by including multiple annual variants of EA Canada's sports titles such as FIFA. In March 1997 Shaw Communcations acquired SC Interactive Video in full, becoming solely responsible for the distribution of the service, which at the time was available in 10,000 Canadian homes. Wharf Holdings announced an agreement with Sega Digital Communications in October of 1995 to broadcast the service in Hong Kong. As with Japan the service was said to have 30 games a month, which would cost each user US$90 deposit plus US$6.50 installation and US$13/y. Nick Fiore, Sega Channel vice president and managing director of international Sega Channels reported that in Hong Kong, the channel was likely to have only partial carriage until the fiber optic system there was more fully constructed and channel space opens up. In January 1996 The Sega Channel was said to be about to turn up on the Universal Cable TV (UTV) system in Bangkok. UTV had recently began providing its CATV service in Bangkok Metropolitan Areas in September 1995. The service was offered on its high quality hybrid fiber coaxial network which it began deploying in 1994. Nick Fiore was particularly keen on the prospects in Thailand. Today UTV is part of Thailand's largest Pay TV operator "True Visions". Sega Digital Communications announced in August of 1994 that the service would launch in Taiwan and South Korea within the year. It's currently unknown whether or not the channel actually ended up launching in South Korea. In January of 1996 Tele-Communications International Inc., the global branch of the US TCI, obtained the rights to distribute and market the channel in the United Kingdom, Northern Ireland, Germany, Malta, the Scandinavian countries, France, Belgium, the Netherlands, Australia, New Zealand, Israel, Switzerland, Hungary, Poland, Spain, Portugal, Italy and Turkey. Of those markets, the English speaking countries of U.K., Malta, New Zealand and Australia were expected to provide Sega launchpads in the next six months. A month later they said they had plans to commence distribution arrangements in western Europe immediately, and expected to involve its program distribution ventures, Flextech PLC in the U.K. and Multithematiques S.A. in France, as well as other organizations, in bringing Sega Channel to new markets. The service was said to be available in four languages: English, French, German and Spanish, and to be also offered to direct-to-home satellite systems. By the time of the U.K. launch in June 1996 TCI announced that they had signed agreements with Deutsche Telekom in Germany, Eneco in The Netherlands, and Telenor in Norway. TCI's Sega Channel offered 25 games a month, but it doesn't appear to have met their commitment to support it in multiple languages, seemingly remaining in just English. The planned satellite service doesn't seem to have come to fruition either. Out of the few countries that it eventually launched in it never expanded beyond the initial test markets, and with the lack of new releases and rapidly declining 16-bit market was already rendered obsolete within just a few months of launch. See also: Sega Channel UK schedule. Sonic, Knuckles and Andi Peters at the UK Sega Channel launch. In the United Kingdom the Sega Channel service was provided by Flextech Plc, part owned by Tele-Communications International. This was the first region of Europe to receive the channel, where it saw a staggered release across the Telewest cable network during 1996. Sega Channel was officially "launched" in London on the 19th of June 1996, though it is not thought to have come into service until July 1st, where it debuted with tests in Telewest's "South East" franchise (Maidstone, Gravesend, Basildon, Chelmsford). The channel then launched in the North East franchise (Gateshead, South Tyneside, Newcastle Upon Tyne, North Tyneside) on the 1st of September, and the North West franchise (Liverpool, Knowsley, St Helens, Wigan, Blackpool) on the 1st of October. The subscription fee was £10 a month., however only 25 games were available at any given time - roughly half of the US offering. The company was said to be "happy" with its performance in 1996. Flextech reportedly invested £1 million into the project as the UK market was seen to be the biggest in Europe (with one million Mega Drive consoles purchased at the time). TCI chose to use NTSC versions of games, and even used the North American ESRB system to rate them. There were technical issues which disrupted the service in late 1997, and along with the other international channels was scrapped around this period, having never expanded beyond the initial launch regions. Sega Channel in the Netherlands began broadcasting in late 1996. The service was provided by Eneco, beginning in the Rotterdam area, with Dordrecht and Schiedam planned for early 1997. Eneco estimated that 20,000 Mega Drive owners would be covered by the service, but only 50 signed up in the first month, starting a trend of poor sales. Despite this, there was no plans to close the channel as long as the operator was provided with CDs, and so it continued throughout 1997, closing at the end of 1997, the same time as the other European Sega Channel services were axed. At the time of closure the service was still limited to Rotterdam, with the planned expansions never occurring. Customers had to deposit ƒ399 to cover modem and set-up fees, and were charged ƒ20 to use the service. In Germany the service was launched as a test service in Kaiserslautern by Deutsche Telekom in late 1996. Whilst still running in October 1997 it was still limited to it's Kaiserslautern test, and was presumably discontinued at the end of 1997 with the rest of the international service. Customers were charged a DM80 set-up fee and a DM28 monthly cost. Along with the U.K., Germany, and the Netherlands, Telenor was announced as the supplier for Norway. It's not currently known if the Sega Channel was actually launched there. Said to be distributed by Austar and Galaxy. There were internal rumours/ talk about it but nothing ever eventuated and Galaxy went bankrupt in 1998. TCI originally said that they planned to involve Multithematiques S.A., although this doesn't appear to have ended up happening. Was expected to be one of TCI's Sega Channel "launchpads". It's not currently known if the Sega Channel was actually launched there. See also: Sega Channel AR schedule. Cablevisión TCI launched the Sega Channel on September 1996, with 25 video games a month and in English and it's thought to have received the same service as Europe. The service had a cost of 15 pesos a month, plus 8 pesos for installation expenses, an aditional 50 pesos of deposit, and 100 pesos for the adaptor (67% of the price of a Mega Drive in Argentina, which at that time was sold for 150 pesos). According to Cablevisión TCI, a month after the launching of the service in Argentina, more than 20,000 people asked for information about the service and approximately 2,000 had subscribed to the service, and was also expected that by the end of 1997, two percent of the 465.900 subscribers of Cablevisión TCI would be subscribed to Sega Channel. Metrópolis Intercom launched the Sega Channel on October 17th, 1996 with 25 video games a month and in English it's thought to have received the same service as Europe. At that time, the coverage of Metropólis Intercom reached the Chilean comunas (communes) of Las Condes, La Reina, Peñalolén, Macul, Ñuñoa, Providencia, Vitacura, Lo Barnechea and a few others, all located in the Santiago Metropolitan Region. There was plans to provide coverage to all Chilean territory, however this goal was never achieved. Early Sega Channel logo, seen in Demo Cartridge #1. In addition to retail Sega Channel units, a number of prototype "demo cartridges" have also been spotted. As the name suggests, the demo cartridges exist to demonstrate what the Sega Channel service was intending to offer, though none physically connect to the Sega Channel network to download games, and contain little more than menus - no playable content. As of 2011 four demo cartridges have been identified, three of them have been dumped. The first to be spotted, "Sega Channel Demo Cartridge #6", appeared for sale on eBay in 2009. Later that year, "Sega Channel Demo Cartridge #4" was spotted and purchased by a resident of Lost Levels, who generously lent the cartridge to LocalH to ROM dump. In 2011 two more prototypes were identified, labeled #1 and #2. The earlier cartridges show a work in-progress Sega Channel in various stages of production, featuring intro sequences, graphics that would be used in the early days of its broadcasting, a simulated downloading sequence, and in the case of cartridge #4, a background/sound test. Looking into the #4 ROM in a hex editor also shows various "SEGATV" error messages, as well as strange code snippets. In the menus of the Sega Channel Demo #4's "Test Drive" section, you can see a listing for "The Magical Quest Starring Mickey Mouse, Capcom". The Magical Quest Starring Mickey Mouse was not released on the Sega Mega Drive/Genesis in any region, though did appear on the Super Nintendo. Main article: Sega Channel/Magazine articles. Sega Channel - Technical details on Sega Channel and its game delivery method.